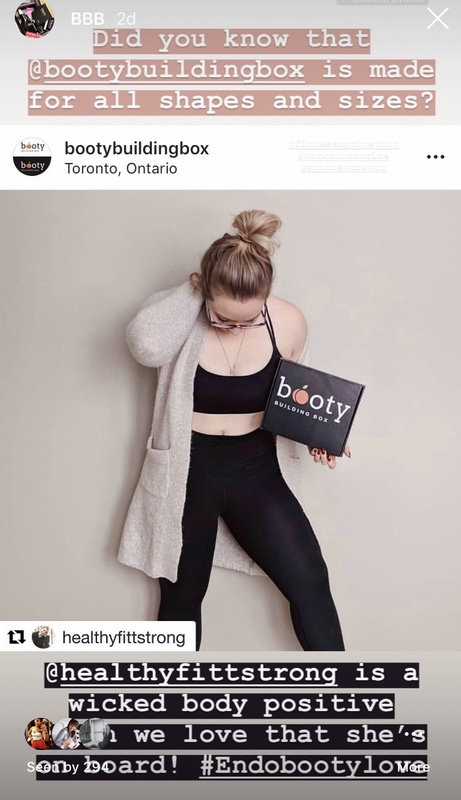 Booty Building Box is a program that was created to get people away from the scale and counting numbers, and back to building lean muscle mass, reshaping body composition and feeling good in your own skin. The “booty-types” were created to step away from that typical diet workout regime that makes you feel like you have to be tiny to feel good. It was created to have people change the way that they think. It’s meant for all shapes and sizes and to feel good at any weight. It’s a fun way to get people active and to start feeling good and strong. We were so happy when Angie reached out to be a part of the Booty Building Box movement. Angie is a wicked body positive coach through her own experiences of mass weight loss and weight training. She’s all about feeling good and being healthy. When she reached out we were excited to have her love the program and want to be involved. She’s an Endo-booty and is so excited to start reshaping her glutes!